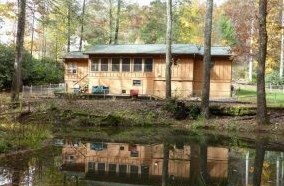 A Mountain Retreat - Fishing Cabin in Lake Toxaway, North Carolina presents a pond stocked with trout and bass. This private property offers a bold creek, large fenced yard, paved frontage. Move in condition with one level living, hardwood and tile floors, wood fireplace with gas logs. You will enjoy the great room with 11'10" wood ceiling, wood walls, 2 bedroom suites with a split bedroom plan. A kitchen any chef will fall in love with, hard surface counters, gas stove and more. Curl up with your favorite book in the heated Carolina Room which overlooks the pond and creek. Families have been drawn to the breathtaking mountain vistas and crystal clear waters of Transylvania County since 1903 when the Fords, Edisons and Rockefellers came by private railroad car. The body of water we know as Lake Toxaway did not always exist. Before 1902, this was a rugged mountain area thick with forest and no paved roadways to travel. But then, as now, people dreamed of getting away from it all, to rejuvenate their health, to renew their spirit. With that in mind, this remote wilderness area evolved into the exclusive resort area of Lake Toxaway. Lake Toxaway is a mountain resort destination offering homes in several unique communities featuring the state's largest private lake. Lake Toxaway is a place where you can enjoy hiking, fishing, and mountain living at it’s best. Located only minutes from Highlands, Cashiers and Brevard, an easy drive from Asheville, Atlanta and Greenville, Lake Toxaway is a place where Mother Nature displays some of her best work, twelve months a year. "You are the most important person in our business and we don't take it lightly!" So give us a call today Jay (828) 421-0375 or Jewell (828) 421-8376.